Doc Gibbs - Charged Particles: Jazz with a Spark! Charged Particles performed with percussionist Leonard “Doc” Gibbs (formerly with Bob James, Grover Washington, Jr., etc.) at Gibby’s Riverview, Dublin, Ohio. Doc Gibbs is one of the most sought after percussionists in the music industry today. Whether he's recording, touring or kickin' it up a notch with Emeril Lagasse. Doc musically operates on an audience with funky rhythms and with his vast assortment of traditional and unusual percussion instruments. Doc received his so-called "Doc"-torate from the late, legendary jazz saxophonist, Grover Washington, Jr. While recording Grover's “Live at the Bijou” album in 1976, Grover acknowledged Doc for prescribing an herbal remedy for a nasty cold that Grover was suffering from the night before taping. Overnight, Leonard Gibbs became Doc when Grover announced to his audience, "...There are two doctors in Philly ... Dr.J (of the 76ers) and Doctor Gibbs." A nickname that appropriately describes a musician who truly performs with the precision of a surgeon. In 1997, Doc became the musical director for Emeril Live!, the popular cooking show featuring Emeril Lagasse. It enjoyed a solid ten-year run and featured a mixture of entertaining guests, Creole-influenced cooking and, to be sure, lots of Doc on camera. 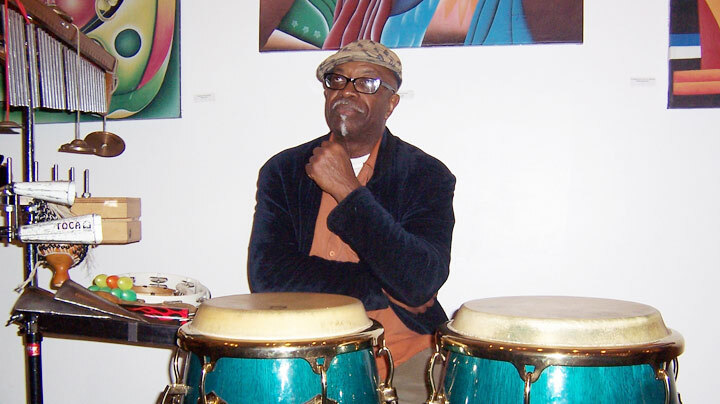 Doc's love of hand drums and percussion instruments began in the early seventies, when he left the Pennsylvania Academy of Fines Art to pursue his real dream - a career as a master percussionist. Early in his career, Doc immediately caught the attention of the music industry's top artists, including George Benson, Nancy Wilson, Bob James, Al Jarreau and Anita Baker, to name a few. Most recently, Doc's percussive reputation has placed him in the studio with Wyclef Jean, Erykah Badu, Eric Benet and hot R&B producer, James Poyser, among others. Doc Gibbs is also an elected member of the board of governors of the National Association of Recording Arts and Sciences, Philadelphia chapter. Doc believes in "giving something back" and, to that end, he performs drum seminars for children under the auspices of Young Audiences of Eastern Pennsylvania and Strings for Schools. In addition, he is a co-founder of the spiritually infused organization Drums for Peace, which seeks to invoke the power of percussion in support of global harmony. His album, "Servin' It Up! Hot!" , was nationally released in June 2002.